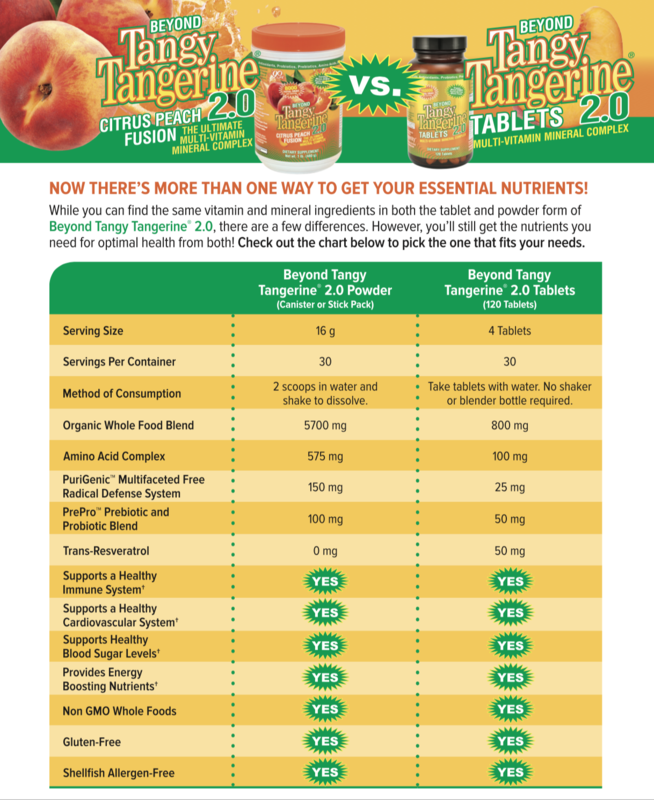 Beyond Tangy Tangerine 2.0 Tablets are now an easier way to provide your body with essential nutrients needed for optimal health. This multi-vitamin mineral complex contains: Whole Foods, Trace Minerals, Antioxidants, Prebiotics and Probiotics, Amino Acids plus Synergizing Nutrients for maximum absorption by the body! Vitamin A, Vitamin C, Vitamin D3, Vitamin E, Vitamin K, Thiamin, Riboflavin, Niacin, Vitamin B6, Folate, Vitamin B12, Pantothenic Acid, Calcium, Iron, Magnesium, Zinc, Selenium, Copper, Chromium, Potassium, Organic Whole Foods [Whole Food Blend (Rice Solids, Acerola fruit extract, Beet Juice, Bilberry fruit, Blueberry fruit, Broccoli sprout, Carrot root, Cauliflower sprout, Chlorella, Cordyceps mushroom, Kale Sprout, Maitake mushroom, Nettle leaves, Parsley leaves, Reishi Mushroom, Shiitake Mushroom, Spinach leaves, Spirulina, Tomato juice), Organic Amino Acid Complex (From whole brown rice sprouts: L-alanine, L-arginine, L-aspartic, L-Cysteine, L-Glutamic Acid, L-Glycine, L-Histidine, L-Isoleucine, L-leucine, L-lysine, L-Methionine, L-Phenylalanine, L-Proline, L-Serine, L-Threonine, L-Tryptophan, L-Tyrosine, L-Valine), Organic Trace Minerals, PuriGenic Multifaceted Free Radical Defense System (Proprietary Blend: Organic Amla bioflavonoids, Selenium, Grape Seed Extract), Organic Beet Root Extract], Glucosamine, MSM, PrePro Prebiotic and Probiotic Blend, Trans-Resveratrol, Chondroitin sulfate, Inositol, Co-enzyme Q10, Boron, Microcrystalline cellulose, stearic acid, vegetable cellulose, di-calcium phosphate, silica, magnesium stearate, pharmaceutical glaze. Click the button below to add the Beyond Tangy Tangerine Tablets 2.0 to your wish list.